What Peter Biskind did for filmmaking, "Time "magazine critic Richard Zoglin does for comedy in this meticulously researched and hilariously readable account of stand-up comedy in the 1970s. In the rock-and-roll 1970s, a new breed of comic, inspired by the fearless Lenny Bruce, made telling jokes an art form. Innovative comedians like George Carlin, Richard Pryor, and Robert Klein, and, later, Steve Martin, Albert Brooks, Robin Williams, and Andy Kaufman, tore through the country and became as big as rock stars in an era when "Saturday Night Live "was the apotheosis of cool and the Improv, Catch a Rising Star, and the Comedy Store were the hottest clubs around. 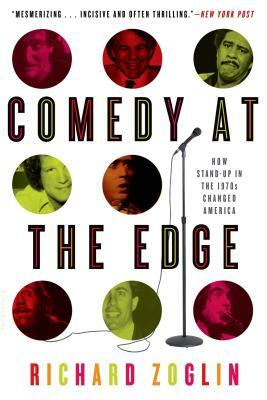 In "Comedy at the Edge," Richard Zoglin gives a backstage view of the time, when a group of brilliant, iconoclastic comedians ruled the world and quite possibly changed it, too. Based on extensive interviews with club owners, agents, producers and with unprecedented and unlimited access to the players themselves "Comedy at the Edge "is a no-holdsbarred, behind-the-scenes look at one of the most influential and tumultuous decades in American popular culture. Richard Zoglin is a senior editor and writer at "Time," who has also served as its television and theater critic. In his twenty years covering entertainment for the magazine, he has written cover stories on Bill Cosby, David Letterman, Diane Sawyer, and Arsenio Hall, among others; and done major pieces on Jerry Seinfeld and Johnny Carson. He lives in New York City.